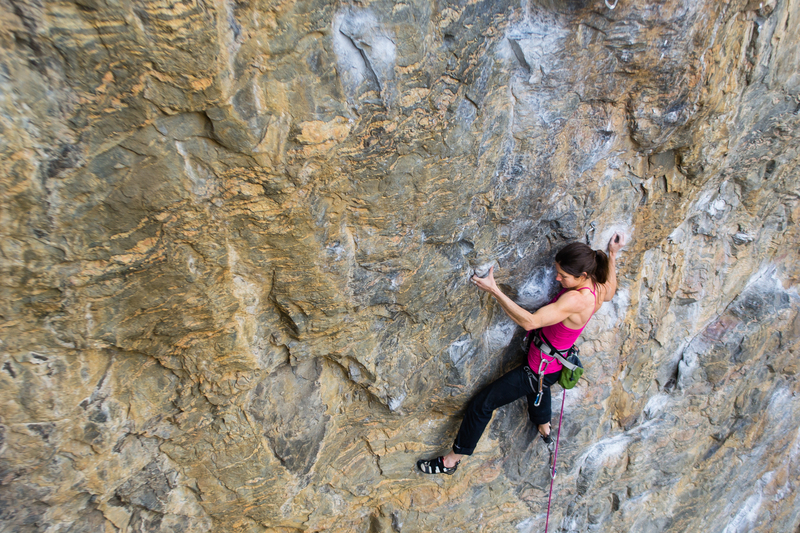 In my climbing, I’m motivated by the challenge and rewards of breaking down mental barriers. Often when I start out on a hard project, I’m overwhelmed by the difficulty and can’t imagine ever succeeding on the climb as a whole. I break the route down into manageable pieces, work hard on each section, and stay positive. Eventually, the climb comes together, and I love that experience of succeeding on what I once thought was impossible. 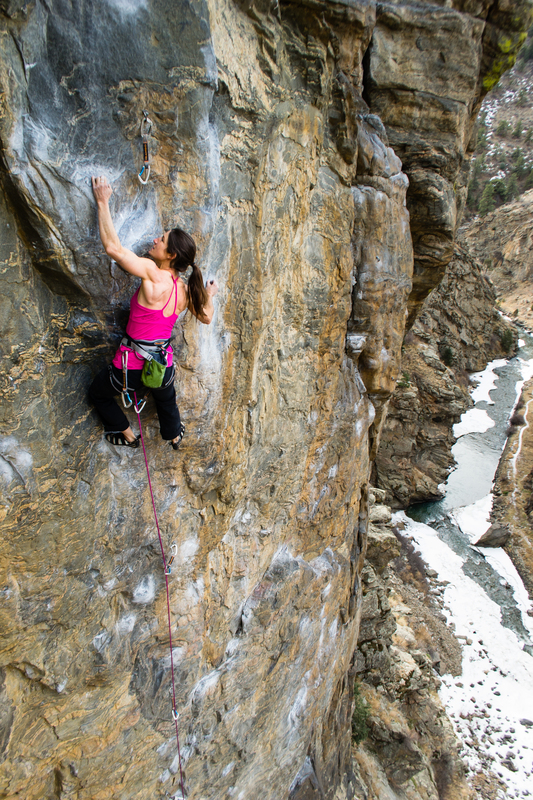 Before kids, climbing was more spontaneous, with weekly adventures at the spur of the moment and by the seat of our pants…an ethic we referred to as “maximizing fun.” The most memorable of these was our attack on Mt Moran, one of the Fifty Classic Climbs. As usual, I loyally agreed to the plan (minus the details)—I was psyched and in love! Friday after work, we raced North from UT, toting a canoe, to meet up with Mark Anderson and Bobby Gomez. We paddled across two lakes at dusk and bivied below the South Buttress. I was content in my sleeping bag anticipating a scenic scramble followed by pizza and ice cream. The climbing went well, or so I thought. It was so fun, we kept climbing and climbing (over many false summits) and topped out just before dusk. Subconsciously, we must have not wanted the fun to end because we expertly failed to find the critical rappel station before dark, despite hours of frenzied search. Instead, we spent a “refreshing” night hunkered on a narrow ledge wrapped in emergency blankets, pining for sunshine. At the time I didn’t think this was so amusing, but when I look back now, it’s one of my strongest and fondest climbing memories – funny how that works. We definitely squeezed every drop of fun out of that weekend. This is a tough question; I’m chronically indecisive! Smith Rock, St. George, the Red, or City of Rocks…? Lander, Wyoming definitely floats towards the top – it’s the whole package. 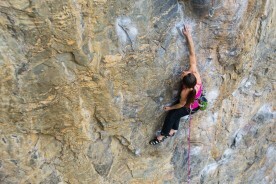 Not only are the scenery and climbing world-class, but its home to a truly amazing climbing community. Friendship is a big part of climbing, so I’m drawn to areas with a strong community. The tight-knit Lander climbers have always embraced our family, so I love spending time there, where we always feel like part of the clan. Janelle Anderson grew up in the shadow of the San Juan Mountains in Colorado and developed an early love for anything outdoors. As soon as she could walk, she was climbing mountains. She became an expert skier on the slopes of Telluride (before it blew up), and learned to climb ice in Ouray. 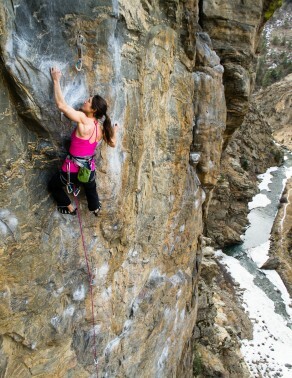 She has climbed numerous difficult alpine routes in the Tetons, Rocky Mountains, Canada, and Alaska. 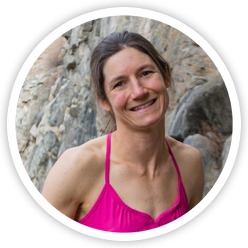 In 2003, she made the first female ascent of the Devil’s Thumb in the remote backcountry of the Alaskan panhandle. 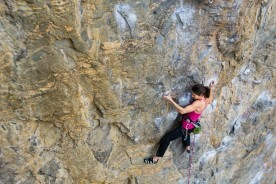 Recently she has focused on high-end rock climbing, and is an authority on climbing training, especially for women. She has repointed up to 5.13 and flashed 5.12+. Janelle is married to Mike Anderson, and has two sons Lucas (12) and Axel (9). She has mastered the art of maintaining a climbing career in the face of motherhood, and has advised numerous prospective climber-moms on the subject.